I graduated from Westmount High School in Montreal in 1974, then earned an Honours B.Sc. in Biology from Concordia University. In 1977, I received an NSERC 1967 Science Scholarship to enter the PhD program in Zoology at the University of British Columbia; I graduated in 1981 and took up an NSERC post-doctoral Fellowship also at UBC for one year and conducted a final year of postdoctoral training at McMaster University (Biology) in 1982-83. I was made aware of the award by my second postdoctoral supervisor, Dr. Chris Wood (Department of Biology, McMaster University). Ironically, he also told me that I didn’t really stand a chance of being successful because the competition for these awards was so stiff. 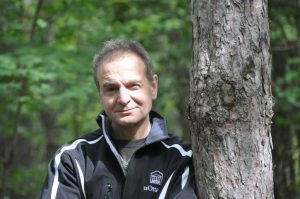 I have been a professor at the University of Ottawa in the Department of Biology since 1983. Currently, I am the Dean of Science. The Eastburn Fellowship was pivotal in allowing me to continue my post-doctoral fellowship training, which, in turn, allowed me to become competitive in the academic job market. Being able to add such a prestigious scholarship to my CV certainly contributed to my success. I was at a crossroads when I applied for the Eastburn, no funding, no prospect of securing a PDF without a scholarship and certainly too junior to be successful in the job market. Quite simply, I would not be a professor today if it were not for the receipt of the Eastburn scholarship – it changed my life.